It’s widely accepted within industry circles that we are through the worst of the headwinds that the Brisbane apartment market will experience. The supply has all but dried up (certainly in the inner ring) and almost all key indicators affecting forward-looking pricing for the Brisbane apartment market are improving, albeit from a low base. A key driver of any property market is population growth (relative to dwelling supply). Queensland has traditionally had stronger population growth than the rest of the country – 2.0 per cent v 1.4 per cent nationally over the last 35 years – but from 2013 onwards, Queensland experienced a dramatic drop in growth post the mining boom (down to 1.5% annually). This has now started to turn around, driven largely by sky high property prices in the southern states and abetted by the increasingly strong economy and jobs market in Queensland. Last year population growth was back above the national average (1.7 per cent v 1.6 per cent). The chart below captures the relationship between dwelling values in Sydney compared to Brisbane and migration numbers. For the first time in years QLD is back above the 20,000 mark for annualised net interstate migration (22k last year) and historically, when coupled with large dwelling price spreads between Brisbane and Sydney, we’ve seen a significant narrowing of that spread via price appreciation in Brisbane. The Queensland economy struggled to transition after the mining boom ended in 2013 as evidenced by anaemic or negative growth in state final demand (SFD) in subsequent years. Calendar years 2013-2015 saw SFD print at 0.6 per cent, -3.4 per cent and -1.7 per cent respectively. Last calendar year saw a strong rebound in this number to 2.9 per cent growth and the number is forecast to grow at a very healthy 3.4 per cent for both 2018 and 2019 according to Deloitte Access Economics. This rebound in state final demand is attributable to a significant turnaround in business investment – the state has now seen seven consecutive quarters of positive growth in business investment following on from 11 quarters of negative growth immediately prior to that. Queensland’s employment growth was the strongest in the country for calendar year 2017 at 4.6 per cent (or 109,000 jobs added). It has plateaued in recent months, but the state is still in the middle of a run of 20 consecutive months of positive employment growth at the time of writing. Notwithstanding the strong supply of new apartments experienced in 2016 and 2017 in Brisbane, the significant and ongoing tightening of the commercial credit markets since, has seen a dramatic reduction in the completion of apartments in Brisbane. Banks are still feeling considerable pressure from APRA in respect to their commercial lending arms and while this continues, it’s difficult to see supply rebounding any time soon. According to Urbis, apartment completions in the inner Brisbane market are set to decrease dramatically in 2018. Where 2017 saw about 7500 apartment completions, 2018 should see only 5,500 complete with 2019 and 2020 completions dropping further still to 2,200 and 2,000 respectively. Forward looking indicators – specifically, apartment approvals – indicate that trend is set to continue. The March quarter saw only 306 apartment approvals in inner Brisbane. At the peak of the apartment approvals market (2014-15) there were, on occasion, 5,000 per quarter. While approvals and starts aren’t 100 per cent correlated, the difference in those numbers is significant. It is also important to note that the broader housing market (apartments, houses and townhouses) is not over supplied. As per JLL’s chart below, in only three of the last 16 years has supply exceeded underlying demand. It is because of this – coupled with the lack of apartments being built and the outlook for strong population growth – that there is a very real chance of the market being undersupplied in 2020 and beyond. This is often overlooked, but the improvement in the quality of apartments produced will significantly underpin values in the long run. While the quantity (supply) of new apartments is falling dramatically, the quality of those apartments being built is noticeably improving. The reasons for this are twofold. Investors have started to demand a higher quality of product in the Brisbane market. Spooked by years of reports of oversupply and worried about holding investment apartments that remain vacant upon completion, investors are now much more discerning about the type and style of apartment they choose to purchase. Almost all developers I have spoken to indicated that investors purchasing apartments are almost as demanding as purchasers that intend to occupy their apartments. On the flip side, the overall level of demand for investment properties has been crimped by APRA-led regulations. However, sales to investors are still crucial for most developers to be able to hit their presale targets to trigger funding. Developers are therefore competing with one another in a much smaller pool of investors and need to ensure their product stacks up when compared with other similarly priced products in surrounding areas. This is an oft quoted number but the importance of the change in both absolute and relative values of Brisbane apartments over time is crucial in determining the forward direction of prices. The table above highlights the median apartment values of the eight major urban areas in Australia. As mentioned, it is important to note the absolute movement in values and the relative movement in values compared with Brisbane and the other east coast cities. Brisbane’s median apartment value in 2018 is only 5 per cent higher than it was in 2008. Sydney’s and Melbourne’s are up 88 per cent and 53 per cent respectively, as a comparison. As a result, Brisbane’s values compared to those two cities has fallen sharply. In 2008, Brisbane’s median apartment value was 90 per cent of Sydney’s and 98 per cent of Melbourne’s. Now, those numbers are just 50 per cent and 67 per cent respectively. 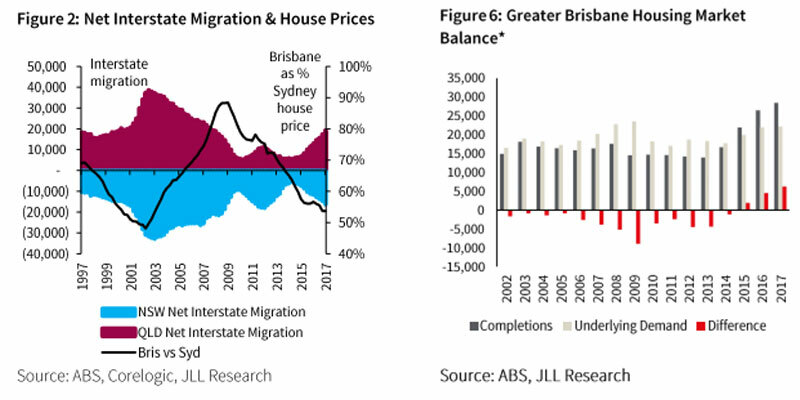 Given the extraordinary run up in prices in both Sydney and Melbourne in the last few years, I would not expect Brisbane to get back to those 2008 ratios (unless Sydney and Melbourne do some of the heavy lifting by coming off considerably). But there is certainly scope for some strong price appreciation for Brisbane in the medium term. Historically those numbers have converged over a cycle (look at the Sydney/Brisbane ratios and the Melbourne/Brisbane ratios for January ’03 compared with January ’08, for instance) and I expect we’ll witness that convergence again play out to some degree in the next 3-5 years. The direction of mortgage rates from here is almost certainly up but given their starting point at once in a life time lows (a quick check at the time of writing reveals floating mortgage rates from the majors at sub 3.80% and 2 year fixed rates only a few basis points higher), I don’t think the level of interest rates is going to significantly crimp demand for housing finance in the foreseeable future. Any movement on rates by the banks will be out of cycle (certainly in the near term as I don’t expect the RBA to move any time soon) and media pressure will keep those movements to a minimum. In fact, given much lower transactional volumes expected in Sydney and Melbourne as a result of recent price depreciation, banks will need to compete strongly for customers to keep their loan books ticking over. This may result in downward pressure on pricing, particularly for high quality borrowers with healthy deposits and strong serviceability metrics. Of any of the east coast cities, Brisbane should be best placed to weather the potential headwinds of rising interest rates give its median household income is marginally higher than Melbourne’s and 88 per cent of Sydney’s whereas the average mortgage size is significantly lower than these ratios by comparison. While the dampening effect on demand for investor apartments because of APRA restrictions will – in theory – suppress price growth, it’s often overlooked that these restrictions also constrain supply of new apartments as developers struggle to achieve presales – a pre-requisite for any development in order to trigger senior debt finance and enable construction to begin. This, of course, has the opposite effect on price growth. I’ve deliberately left this one until last as it is hugely important but hard to quantify, no less predict. In a perfect world, sentiment and market fundamentals would be reasonably closely aligned. However, that’s often not the case and sentiment can often end up being a construct of the media with little if any concrete evidence behind the flow of information (Y2K bug anyone?). In recent years, the mainstream media has taken great delight in bashing the Brisbane apartment market. Some of that criticism has been warranted as there were some sub-standard developments that were able to get out of the ground because of cheap and available credit – both for the developer and the end purchaser. The oversupply of poor quality apartments that Brisbane has faced has been localised and is not indicative of a wider market problem. 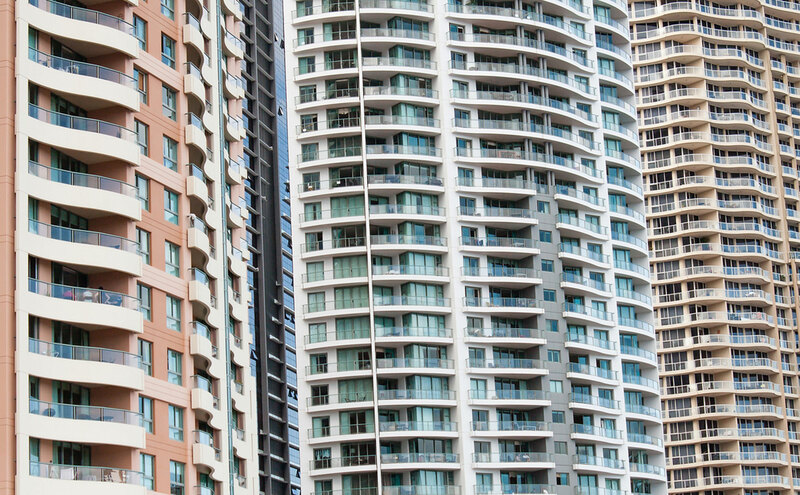 Indeed, JLL concluded in their recent report about the Brisbane apartment market that “our analysis of the re-sales of apartments completed over the last 3 years clearly illustrates that it is this lower end stock that has borne the brunt of the market slow down”. They went on to further add that “the discrepancy between performance of low and high quality stock is significant”. I expect the sentiment around the Brisbane apartment market to improve markedly over the next 24 months because of a combination of the improving fundamentals outlined here coupled with a “disaster hungry” media focusing their attentions on the lagging property markets of Sydney and Melbourne. How much flow on effect is felt by the Brisbane apartment market from the downturn in the southern states’ property markets – the contagion effect – is difficult to quantify, but the fundamentals of the Brisbane market are certainly all heading in the right direction.